It’s so cold and I can hardly see. It feels like it’s beginning to rain, so I wrap my arms tightly around my shivering body. How did I get here? I was asleep – dreaming of some wonderful place, but now I am conscious – oh, too conscious and I’m wishing I were still in my bed. My God, where am I? It’s dark, too dark to gauge anything. It seems stony but they are too big to be stones, rocks or boulders, perhaps. A glimmer in the darkness tells me that I am standing along side a lake. The moon is hidden behind a blanket of cloud, I can see it’s hazy silhouette travelling quickly beyond the greyness. When it breaks through the cloud maybe I will discern my surroundings. Until then I will wait here and just try to stay calm. My eyes are beginning to adjust to the darkness and the cold is getting through. My skin is wet and goose bumps have completely taken over. I’m shaking, is it through cold or fear? I’m not certain maybe both – probably both. At last the moon is breaking the clouds. I need to take everything in quickly before I am once again shrouded in darkness. My surroundings seem monotone. I appear to be in some kind of quarry with a line of people in front of me. There could be five or six of us it’s hard to tell. I can’t make out their features. Even when they glance round at me I cannot discern any detail – they are merely silhouettes. We seem to be standing at the mouth of a cavern, a black hole in the rock face. I don’t know why or what we can possibly be waiting for? Through my bare feet, I feel a rumbling. It’s getting stronger and louder. The noise is coming from the cave. Everyone is pulling forward. I try to break free but I can’t. I am in this queue whether I like it or not. Something is emerging from the mouth of the cave. It’s silvery, metallic and shiny and it’s coming fast – now it’s slowing. It’s a … it looks like the car from a roller coaster. I can see it clearly now. It’s pewter and chrome with small black wheels. If I lean, can see the tracks, they end a few meters outside the cavern. The car has drawn to a halt. The queue pulls forward and although my actions are involuntary – I too, step forward. Someone is getting in the car, a featureless figure. To the outside, it looks like he is going voluntarily but I am beginning to think differently. The bars have clamped him in. I hear his muffled cries as the car draws back inside the cave, and is gone. I sense someone behind me. As I glance round, I see what I think is a man, I cannot be certain. He is another featureless silhouette and seems to be glancing around frantically as he tries to discern these strange surroundings. I cannot speak, but even if I could, there is nothing I can tell him. It’s quiet apart from the faint sound of water drawing backwards and forwards over the lake’s gravel base. Once again, I try to pull away but cannot. The familiar rumbling is beginning to resonate beneath my feet. I hear it coming … I know at any moment the car will reappear. There it is, but it is empty and the bar, once again, raised. I crane my head to see. Something is being secreted from the wheels, something thick and dark, shining like treacle in the moonlight. My pulse quickens as the next in line takes to the seat of the car. The bar comes down imprisoning him. The queue moves forward and the car disappears. I am getting closer. I feel heat coming from the mouth of the cave. Behind me, more and more people are joining the queue. Faceless shadows of the people they thought they were. The empty car returns and the queue moves forward. The heat is intensifying the closer I get. The clouds have re-formed and once again we are in darkness. The empty car returns and the queue move forward. I can see the tracks more clearly now. They are covered in the blood and entrails of the car’s previous occupants. Panic is rising inside of me. I feel like I’m going to explode. The empty car returns and the queue move forward. 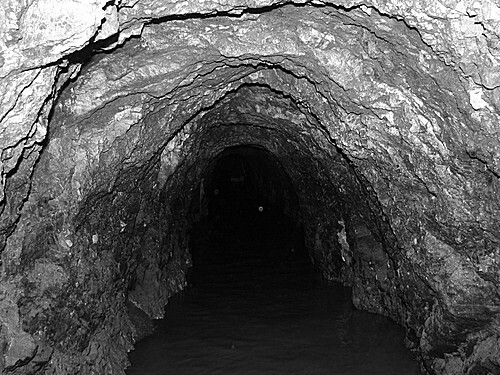 Before me lies the mouth of the tunnel. Burning heat is radiating from the entrance. Sweat is pouring off me as I stare into the void. The empty car returns and the queue – I move forward. I feel myself climbing into the hot metal car. I cannot help it – I cannot stop. The bar clamps me in so tightly I can’t move. The car begins to move. The heat is unbearable, I take one last look behind me, and the queue is moving forward. With Halloween just around the corner, it’s time to plan my annual trip to one of the most atmospheric towns in the UK. This year three of us aspiring writers are planning to visit York. As one of the most haunted cities in England it seems the natural choice. Last year we chose the ancient city of Edinburgh and we couldn’t have picked a better location. From beginning to end the weekend was filled with surprises. The first being the hotel. Standing at reception we were handed the keys to the only room they had left — Room 13! The day began early, with the flight bringing us in just in time for breakfast. We spent the day re- familiarizing ourselves with the stunning city, and the Scottish weather was unusually warm for the time of year. My companion was interested in seeing Greyfriars after having read the book Greyfriars Bobby as a child. I happily went along as I’ve always had a passion for graveyards. I have to say, we both fell head over heals in love with Greyfriars Kirkyard. 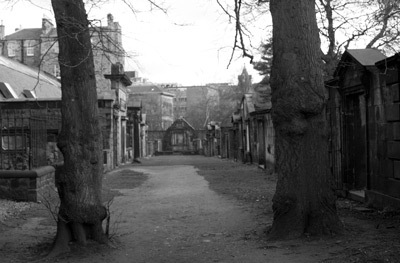 Famous for the story of the dog that wouldn’t leave the grave of his master and also for the infamous grave robbing of Burke and Hare, there is something about that place, the atmosphere within those walls is undeniable. From the moment we stepped through the huge iron gates we felt a presence. We knew there was something very strange, not the usual calm, peacefulness of a graveyard but an eerie-ness that was almost repellant. Desperate to learn more we booked ourselves into the 11pm tour. Wow, that was popular. Over sixty of us traipsed across the graveyard listening to stories of imprisonment and grave robbing that go back hundreds of years. The whole graveyard is built on a foundation of thousands of human bones discarded during the great plague years. During particularly wet weather bones have been known to rise up through the grass and have to be disposed of in ‘the larder’. 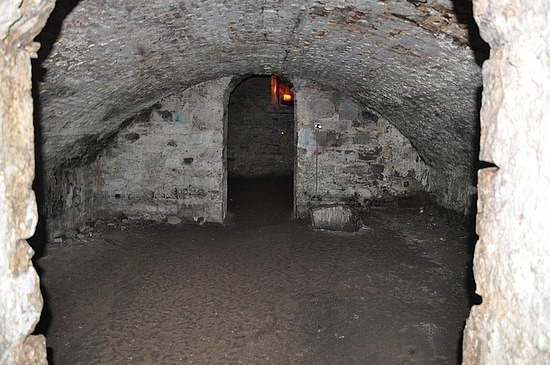 Around 1679, 1200 people were imprisoned in what’s known as the Covenanters Prison. Being no more than a walled section of the graveyard, the prisoners were made to lay face down on the ground for over six months of the harsh Scottish winter. If they tried to move they were shot. Unsurprisingly most perished. 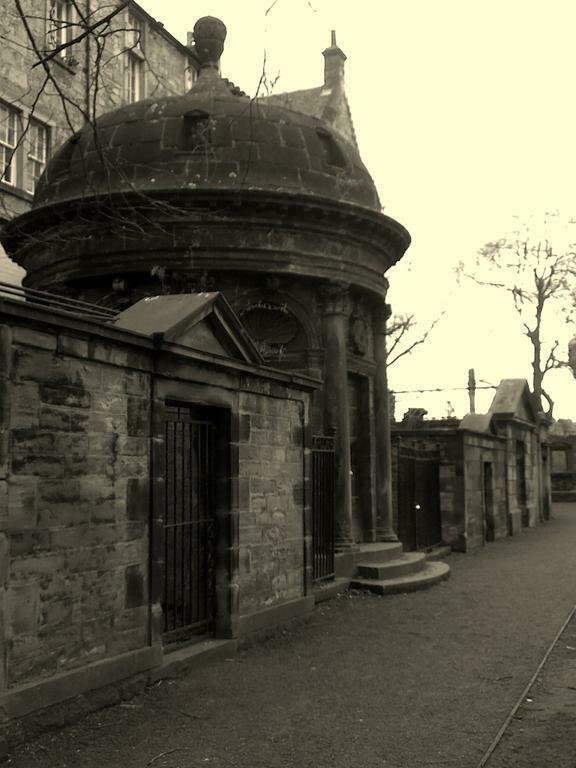 George Mackenzie ran the prison and was himself buried in the graveyard in the 1690’s. 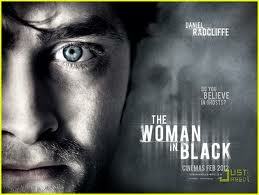 It is said to be his ghost that haunts the graveyard and it has become very famous for its violent activity. If you look through the grille on the front of his tomb you can see the entrance to the crypt still containing his coffin. A story tells of a tramp that took shelter in the crypt only to discover it is also full of the bones of plague victims. During a tour of the underground caverns we clearly heard footsteps in the empty chamber behind us. Again there were lots of people on our tour which did kill the atmosphere a little but those footsteps were unmistakable. unfortunately we were unable to visit Mary Kings Close, oh well there’s always a next time. Okay so I admit that I was one of the sad muppets that fainted on the tour but I attribute that to a very long day and drop in blood pressure, not the terrifying experiences of Edinburgh’s ghost tour. It soon became clear that the Halloween visitors to Edinburgh take the whole thing very seriously. One moment you are on a tour with the cast of Night of the Living Dead, the next moment you are walking down the street with a six-foot smurf or a bunch of very butch ladies with beards. Clearly anything goes. 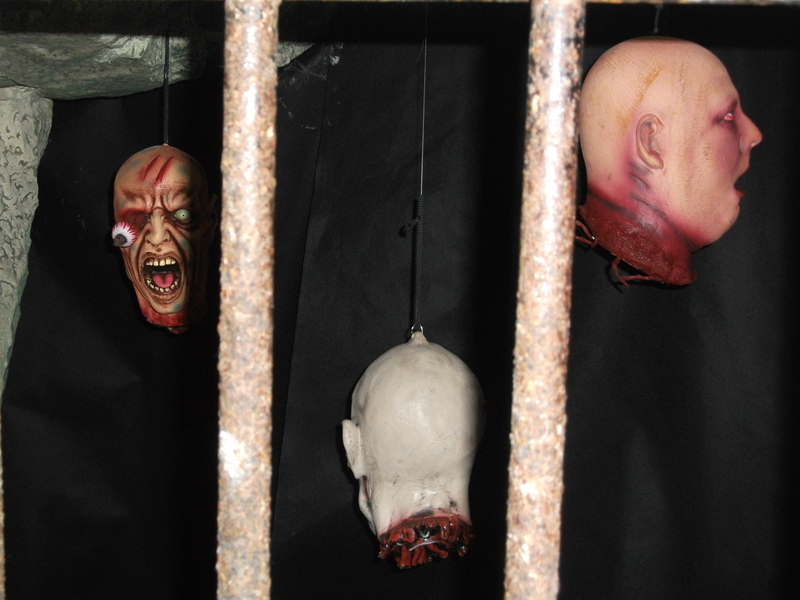 If you love Halloween and are looking for somewhere with unbeatable atmosphere, I would highly recommend Edinburgh. So, May’s moon is currently waxing gibbous. 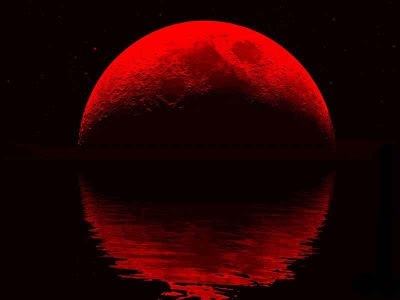 The moon will be at its fullest tomorrow night (17th), which has been hinted at beautifully over the past few evenings. 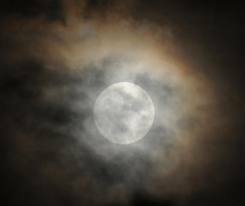 Last night the bright moon was haloed through the moody clouds… it was so atmospheric, and just screaming out to be the back drop for the next horror film. May’s moon is called the Full Flower Moon, as flowers are abundant after April’s traditional rainfall. Fancy a spooky story? Here’s a lunchtime short. 1884 was the year that my wife, Antoinette, and I first acquired the coaching inn by the name of Ye Olde Duke. Located on the windswept, planes bordering England and Wales, the inn was sturdy in its design. Built from the local Cotswold stone it had remained relatively untouched for almost a century. Famed for it’s warm atmosphere and impressive inglenook fires, Ye Olde Duke had been the heart and soul of the village for centuries. As well as the folk traveling through, it was also frequented by many of the villagers. 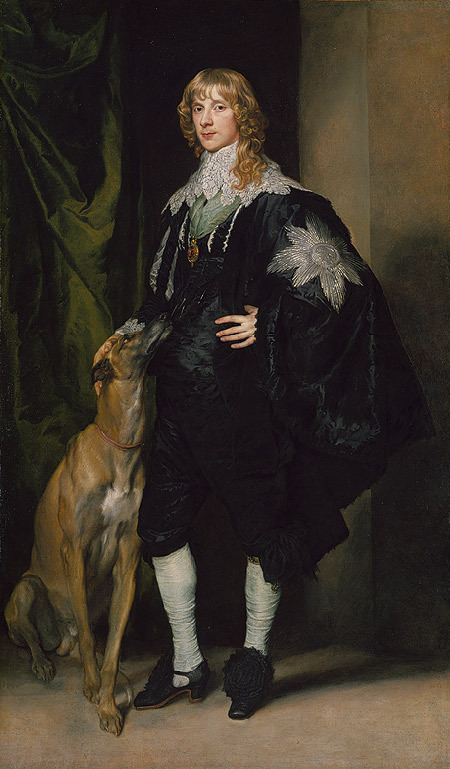 The pride of the inn was the enormous portrait of the once, Duke of Gloucester, wearing his regimentals, dignified in his pose with his trusty dog, Ferdinand, standing proudly by his masters side. The duo had watched over the main hallway since the inn was constructed back in the early 1700’s. Antoinette and I took over the running of the inn in early May of that year, spring has such a wonderful freshness about it, and seemed the perfect time to embark on our new venture. I of course ran the bar and attended to my customers while my wife ran the kitchens, she had always been a proud cook and her warm hearty meals were appreciated by all. From the day we moved into the property, Antoinette began to complain about an uneasiness she felt whenever alone inside. There was a distinct chill to the air that remained well into the high summer months. She said that shadows seemed to move around her as she walked, and she sometimes felt a whisper of breath on her face as she lay still in her bed. I tried to explain to her that the apparent staring was resulted from the angle of the eyes and the artist’s skill with the brush. “I believe it would benefit from a swift move towards the attic” she crowed with vexation. “You know we can’t do that my dear. He’s in the deeds, you know there is a covenant to specify that he has to stay mounted on that very wall for as long as this building remains standing.” Antoinette was not satisfied by my argument but she seemed to quieten down about it for a while. Our first summer passed swiftly, business did not go as well as expected and of course my dear wife could only blame the painting for our personal failings. “I told you that wretched thing is cursed,” she stated as I leafed through the books trying to make head nor tail of our accounts. Antoinette remained adamant that the portrait of The Duke was detrimental to trade, so I took out the deeds to check the covenant. Indeed it stated in clear black penmanship that the portrait was to stay mounted above the stairs whilst the building remained standing. “But the travelers hate it as much as I do,” she returned. I couldn’t deny that she was right about that. The months began to flit by and before long the nights were beginning to draw in signifying the beginning of autumn. There had been no improvement to our profits, so we decided to have some alterations carried out on the property, in a hope to improve trade before Christmas came upon us. We had the entire building decorated throughout in a more elegant, modern style hoping to appeal to more travelers as they passed by our doors. Electric lighting was installed throughout the inn at a large expense to myself, but my wife had insisted upon its necessity. 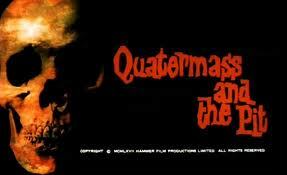 Still The Duke haunted us. It was no longer just my wife who had a problem with his presence, I too felt him whenever I happened to pass by the portrait, his eyes seemed to burn into my flesh and I couldn’t help wondering if Antoinette was right about a curse. Whilst in bed that evening, my dear wife came up with a most intriguing remedy to our predicament. I could see her reasoning; several passing customers had mentioned it’s off putting demeanor and eerie stare and I wondered if indeed it was preventing passing trade. I spoke to the workmen who had been carrying out the renovations and they agreed to place a brick wall directly in front of the old one encapsulating the portrait, which would remain mounted on the specified wall above the grand staircase. Within a week the work was completed and a new modern painting hung in the very position of The Duke. Generally the villagers were relieved to be rid of the painting, although some of the older generation saw it as a slur taking The Duke himself out of Ye Olde Duke Inn. All in all I believe our takings did steadily increase from the day we re-opened. We kept our Duke’s new home to ourselves or should I actually say his continued inhabitation of his existing home. For the next few months things seemed to settle down and our life in our newly renovated inn became calm. Autumn bled into winter and before long a dusting of snow began to settle on the ground. Christmas fast approached and we planned our own festivities for the locals in the inn. We put a huge Christmas tree in the hallway and adorned all the surfaces with holly and such decorative fauna. Candles illuminated the main bar and Antoinette had prepared all manner of hearty treats for our customers. Christmas eve was the highlight of our merriment. We had nearly fifty guests and all were enjoying the revilement, mulled wine and tankards of ale had been flowing freely when the subject of my guests turned to the portrait. I was unaware that the locals knew of the covenant and I was blissful in my ignorance. “Tell me Henry, what have you done with the painting of The Duke?” was the beginning of the questioning from Mr Forbes. He was a landowner and had frequented the inn for the past twenty seven years. “I see. But you do realise that this inn is the foundation of our village, and the portrait is the heart of this inn, it was under no circumstances ever to be removed” he added. Mr Warnly looked interested “Go on,” his voice was deep and aged, it matched the deep lines that time had etched into his face. “The portrait of The Duke? Is it not a requisition of the law that it is to remain mounted on that wall there?” he pointed to the new painting that hung merrily in its place. Mr Warnly looked puzzled for a moment. “Why … is it not still there?” he enquired squinting as he tried to focus on the new painting. “Is that so Henry? I do believe you need to replace the portrait forthwith as you are evidently breaking the law, and I for one will no longer be able to drink in this establishment in that knowledge.” There was a hum of agreement from the other villagers. Of course I was stunned at my regular customers opinions on this matter. I tried to explain that the portrait was still mounted within the building preferring not to go into detail for fear of their reaction. My wife however was not so clandestine in our little secret. It was not long before she readied them in the knowledge of the paintings whereabouts. She saw our little charade as clever and was surprised at everyone else’s shocked reaction. There was an outcry. The alcohol had been flowing all evening and people were not shy in their opinions. All of our guests pushed their way out into the hallway and stared at the new floral painting that graced the newly redecorated hallway with such an airy delight. It stood in the place of their beloved portrait of The Duke. Several of the younger men approached the new painting and together they lifted it off of the wall, tapping on the brickwork to establish that it was indeed a new level. At that moment a very drunk young man stormed up to the wall carrying a sledgehammer. With no hesitation he wielded a blow at the new brickwork. My cries fell on deaf ears as the drunken locals thought this was a brave and admirable idea. At first nothing happened so he tried again and again. Antoinette was, at this point hysterical; her brand new decoration was being utterly destroyed on a whim by these idiotic drunks. At that moment the man broke through the layer of bricks and created a small hole. Some of the others helped him clear away a few bricks but there was no obvious sign of the painting. I was terrified that they wouldn’t believe me, that our hiding place for the picture upheld its legality. A candle was lit and held to the hole, I expected to see part of the guilt frame shine from within but I could see nothing. Cries of “Liar” were being hurled at my wife and myself. So I actually found myself assisting the demolition of my own property in a desperate attempt to prove my legitimacy. Several layers of bricks were removed before the full horror became apparent. There positioned in the recess, propped up against the wall, in the exact pose of The Duke was a blackened, dust webbed, full size man’s skeleton. My wife screamed in horror and fainted before all of the gasping gentlemen. The younger men continued to strip the wall away only to be faced with an additional skeleton of a trusty dog obediently healed by his master’s side.